Wash the pork belly and remove any hair on the rind/skin, pat dry with paper towel. Prick/poke the rind as many holes as possible, this is important step to make the rind crispy. I poke holes using the sharp tip of the veggie and fruit peeler. Made a few slits on the meat for better absorption of seasoning..
First coat the rind and pork belly meat with cooking wine, then only marinate the meat with above seasoning but not the rind/skin. Air dry the whole pork belly openly in the fridge with the rind facing upward. Ok to leave in the fridge for days until you wish to bake. Best to leave it for at least 1 day to have good crispy result. Wrap the pork belly with aluminum foil and place in a baking tray, make sure the height of the foil is 1 inch higher than the pork belly. Coat at least 1 inch thickness of coarse salt on the rind, this to make the water at the rind surface to evaporate to achieve crispy skin effect. Pre-heat the oven at 230 degree celcius for 15 min. 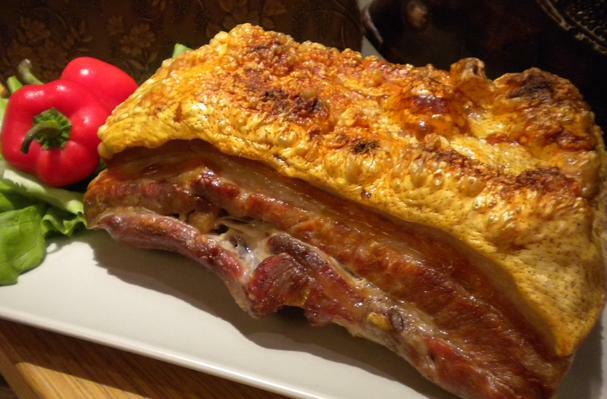 Bake the pork belly at the center of oven for 50 minutes. After 50 minutes, take out the pork belly and get rid of the coaarse salt. Change the bake mode to grill and reduce the heat to 210 degree celcius and put back pork belly at higher rack of the oven to girll for another 20 minutes or until the rind is crispy. From my experience the rind will start crackling after 15 minuets at grill mode. This is simplified homemade version of Hong Kong style roast pork belly. Easy to make and taste as good as what normally serves in Hong Kong Chinese restaurants.